about those dolls in booster's toybox in smrpg you couldn't figure out... one is definitely a goomba, and the other is probably either booster or one of those weird glasses with the nose and the mustache and eyebrows. Deezer: Hmm... Yeah, Goomba is good enough for me. Didnt you die? Arent there about six different Abbys? I hate you, Abby! Deezer: But Abby loves you! how do you pass wold7fortress ? Deezer: We're assuming you mean the World 7 Fortress in Super Mario Bros. 3. We're also assuming you're asking about the first fortress in World 7. First, you must find the Tanooki Suit in the fortress, and fly up above the second candlestick to find a pipe that leads to BOOM BOOM. I found Mario Refrences(can't spell)!!! 1. In the movie "Revenge of the Nerds III", the part with the house(which I don't know), has some of the Nerds coming over the house. Then one nerd pushes the doorbell, then it comes with the 2 "Super Mario Bros. 3" sounds: "??? Some MARIO 3 Sound ???" and then "part of Overworld". 2. I found a Nintendo� All-Stars Fruit Snacks when I was going to the store!!! 2. Dang, I keep forgetting to buy one and scan it. Great layout for the games page. Did you know that Princess Toadstool appears in Kirby Super Star? It is somewhat complicated to do, however. In the Spring Breeze game, when you defeat King Dedede, he will stumble backwards before collapsing. If you cause him to fall back to the edge of the ring, the screen will shift past Mario and reveal more of the crowd. She can be seen sitting behind Mario. I know there's a handful of people here who know what Medabots is; An anime and a Pokemon ripoff at best. Still I watch it a few times because 1. I'm an anime fan and 2. It has the appeal of cafeteria cookies: stale but strangely addictive. I noticed on one episode where the kids' hardass teacher/coach was trying to beat some Yakuza in a battle (between their Medabots) for a vacant lot so he could make a playground but he gets beaten, then Ikki comes to the rescue to battle the Yakuza in his coach's place. Then there's the referee who appears everywhere to make the battle official only this time he appears by coming up from a pipe: Much like a Mario game. Also notice the referee has a bushy mustache which is the icing on the cake. Do Birdo and Yoshi like each other or what? 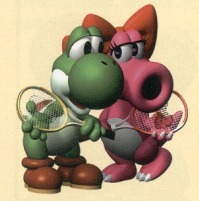 Deezer: Here's a picture from page 12 of the Mario Tennis (N64) manual. Who knows, maybe they're just exchanging tennis tips. I have hated the taste of mushrooms since my birth. This is ironic because I love Mario games. As a child, I remember my parents tempting me with encouragement like, "Eat your mushrooms and you'll become super like Mario!" and, "Mario eats his mushrooms. Why can't you?" also, "Eat your damn mushrooms right now!" I always resisted. Even funnier, I don't ever remember actually tasting a mushroom--not even once. Where does this information lead to? Yesterday, for dinner there was a large serving of chicken stir-fry on my plate. There were several mushrooms. I'm a lot smarter than I was as a child. I'm also more tolerant. I lobbed a few mushrooms into my mouth with my fork. They weren't so bad. I had waited 16 years to taste a scrumptious fungus. Deezer: And let me guess, you didn't become "super" like Mario. The moral of this story is, parents will lie to make you eat stuff. I was just wondering you know that the less often you see someone is the better you look at them. I think Luigi should stay 2nd player. If Luigis mansio stinks then luigi will be hated. Anyways if you like lugi so much then how come your stie takes after mario?!? Deezer: We feel that every Mario character should have equal rights. Deezer: We think so too. Hello, whoever's doing the mailbag. Now, I found the original The Lost World: Jurassic Park screenplay, and it has a "Mario" reference in it. While on the boat going to the island. The female paleontologist, Sarah Harding, walks up to the photographer, Nick Van Owen, whom is playing on a Game Boy. Sarah asks Nick if he's going to bring Donkey Kong onto the island. Well, that scene was omitted, because in the actual movie, Sarah gets to the island before Nick and the others get there. Just thought you'd like to know. Deezer: I feel like I've been ripped-off. This is the second time I'm sending this message, since the first time, it was answered by J.J. under the guise of Abby. He needs to get his facts straight, as he denied what I stated, when it was obviously right. Anyway, in the Mariopedia, the Cheep Cheep (SMW) and Blurp are listed with each other's pictures. (Note: Last time I said they had each other's names, but pictures seems to make more sense.) I've attached two pictures two this e-mail as proof. That's a Cheep Cheep's picture listed under Blurp, and vice versa. There's also a third picture from the enemy cast of SMW. It shows the green fish times 3 and says right there, plain as day that they are Blurps, not Cheep Cheeps. Deezer: We went with Nintendo's Mario Mania players guide for the names of the fish. What NES game would you recommend, besides a Mario game? I'm back. With one question this time. Did you know that Histeria characters call Stalin as "One of the Mario Bros." by his moustache? I didn't. And you? Deezer: I feel so enlightened.